Stealth Lodge Racing :: Can we go back to back???? Can we go back to back???? Today sees the running of the 2013 Port Fairy Cup. The meeting has been in some doubt with the Warrnambool track having to undergo maintenance to fix a 40cm deep hole that was discovered on Oaks Day. Unfortunately the hole forced the cancellation of the rest of the program and another race day on November 21st had to be transferred to Terang. But we are back at our home track to hopefully make it back to back Port Fairy Cups. Scaredymac who won the Cup last year contests the 1400m event again, along with stable mate Millie’s Mann. Scaredymac is the old stalwart of the team at 8 years of age and really needs to show some improvement on his previous starts this preparation. He’s back on his home track and generally runs well fresh, so fingers crossed he can improve today. Millie’s Mann has shown she is one tough honest mare, with this being her 10th start this preparation. She was not too far away in the China Bowl over 1600m at her last start, however she drops back in distance here but should put in another competitive run. I Am In Command is our other runner for the day in the 0-68 Handicap over 1400m. 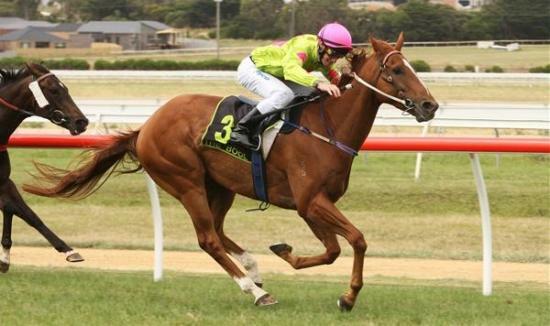 He didn’t appear to handle the tight Dunkeld track at his last start and will definitely appreciate the longer straight at Warrnambool today. Best of Luck to all owners involved today.